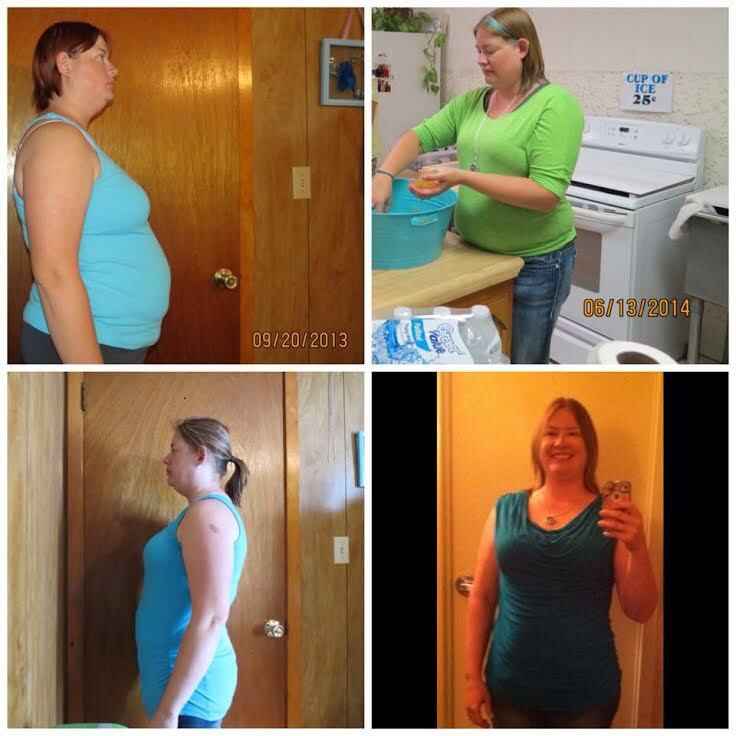 To get the results like Siobhan, click here to get started. A year from now you will thank yourself! Craig, this is a love letter to you. We have been through so many ups and downs throughout our 14 years of marriage including 2 job losses. But no matter what life throws at us, you have always been my rock and #1 supporter. I have to believe that most men wouldn’t be as cool as you when it comes to all the “dirty work” you do behind the scenes and yet do not get the credit like you should. This business should be called “CRAIG and Maria Mind Body Health” but you never complain about needing a title or recognition. This love letter may seem goofy that I am writing this on a blog post, but I need you to know that all you do for our family does not go unnoticed; you make sure the dishwasher is loaded “properly” (and re-load it when I do it so dishes actually get clean! lol), home-school the boys with patience and love, answer blog questions and Facebook questions when I am too busy with clients, do the laundry (I haven’t folded clothes in over 2 months! 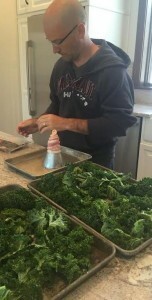 ), you make sure my Kale Chip addiction is full-filled by making them perfectly crispy for me, and as well as many other things such as make forms out of sheet metal for these amazing BA-CONES! Line a large baking sheet with defined edges with unbleached parchment paper. Using cone-shaped metal (we made our own with sheet metal), wrap one slice of bacon around each. Wrap the bacon tightly, overlapping the edges so the bacon totally covers the cone. Bake for 15-20 minutes or until bacon is crisp. Remove from oven and allow to totally cool. Meanwhile make the ice cream. In a blender (I used my blendtec), place the coconut oil, MCT oil, eggs, yolks, almond milk/water, extract, natural sweetener and salt. Blend until very smooth. 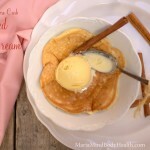 Place into ice cream maker and watch the magic happen! Meanwhile, make the peanut butter swirl by combining the peanut butter, coconut oil/butter and natural sweetener in a small bowl. Combine until smooth. Cool in fridge until ice cream is almost done. Swirl into the ice cream maker for the last 30 seconds. Ps–I hope I find my Craig one day! A lovely compliment to fine man. Steps up to be the servant and does the things that need to be done. You have a treasure! As for you BA-CONES I am in live! Craig is amazing, thank you Craig. So glad you found each other and so glad we found you! Maria, I love that you are thankful! Craig does sound indeed! like a man most men could learn from…though I’m sure if I were the success you are by all I see of you, mine wouldn’t mind helping more a bit! Keep up the good work girl, you are an inspiration to us all…thank you for all your behind-the-scenes support, Craig :D! wow – love this post. Indeed it’s a treasure to have the love and support of the most important person in your life. Thanks for sharing your insight and also thanks for sharing EVERYthing you do with us all. 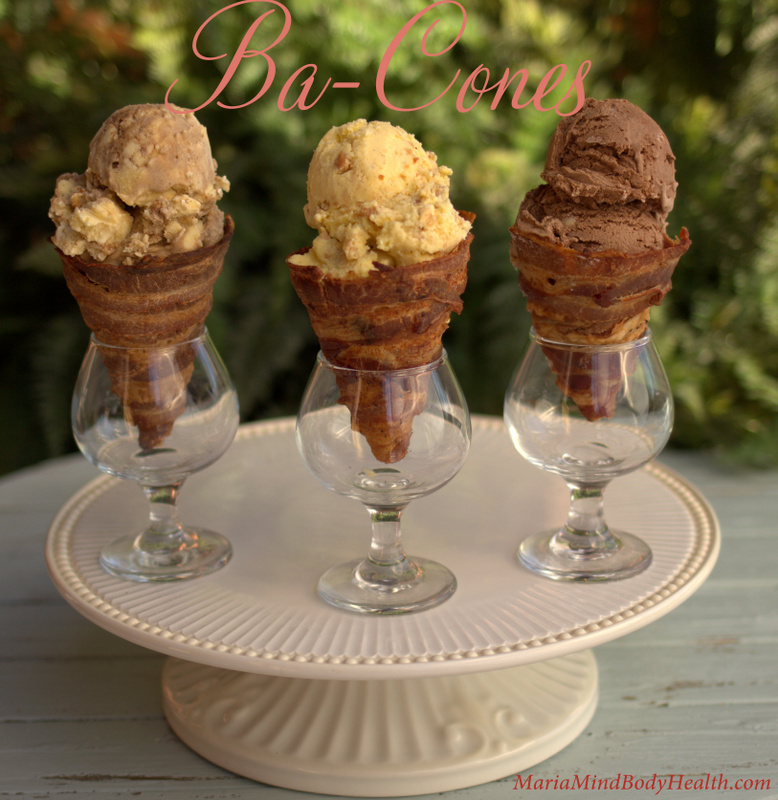 Ba-cones: pure genius! have to try them as soon as I get an ice-cream maker. 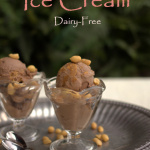 Very impressed that you have a dairy-free ice cream! awesome! I am having a hard time figuring out from the book exactly what suppleness to take. It seems like so many. Are there any that can be combined in one and what is a good natural multi vitamin for women to take at 50 with hypothyroidism? Can I find all of them on your site at amazon? The easiest thing to do is get my supplement plan here. It is very detailed and includes everything needed for each condition. 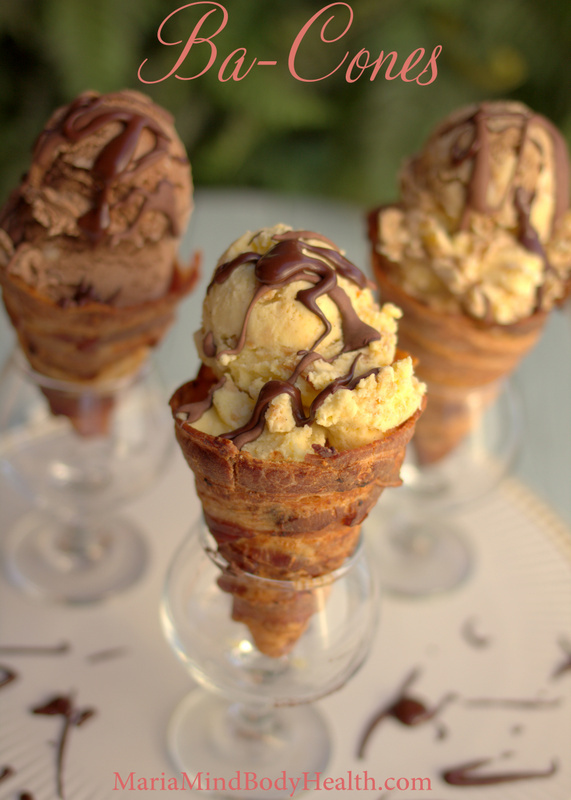 Ba-Cones!!?!! Really?! I’ve died and gone to heaven. Maria, I think I have a “man crush” on your husband. These are just what the doctor ordered!!! As always, thanks to you both for your persistence and brilliance. Hi Maria, I was wondering what you think about non-gmo sunflower lecithin? I am vigilant about staying away from soy lecithin, (and all soy products) but just about every protein powder has it and my mom found one with sunflower lecithin instead. Can you tell me how much this makes? I only have a big ice cream maker so should I invest in a smaller (like 1.5 Qt) maker? What do you use? thanks! Can’t wait to try these cones. Maria – I bought some cones for making cream horns. I can’t get the wrapped bacon off the cones after they are cooked. Fortunately I only tried it on three of them. I chipped the bacon off and used it in an omelet. Any ideas on what I am doing wrong? I used very thin sliced bacon. Should I use thicker sliced bacon next time? 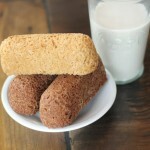 Love your site, love your recipes, love lo-carb!! !